Hello! Welcome to "Truth is never on one side", the TAFL and TFL approved fanlisting dedicated to Asahina Satoru & Watanabe Saki, the main heroes from the light novel, manga and anime series Shinsekai Yori (also known as From the New World), written by the awesome Kishi Yusuke! Satoru and Saki are the characters that more than any others represent a side of the world that people always try to hide. I'm not speaking of the usual, real world only, but of our personal, little world inside of us, the one that we create and use as we prefer, to live quietly. 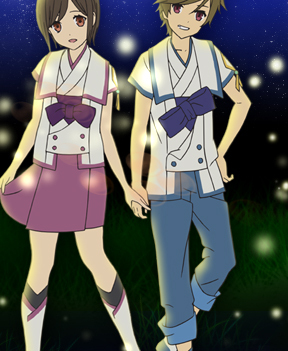 Satoru and Saki live in a village where the rules and the way to live are based on the will of the ones that represent the authorities for the civilization, but the truth is that they just try to create a perfect and "sane" world, deleting everything they think should become "dangerous" in future for everyone. The major part of the people do accept the situation, but there are brave and strong guys ready to find the truth about the village, their story and their own lives. Satoru and Saki are the best example of people that decide to find the truth, whatever it takes, and that fight with all themselves for their comrades' sake, risking their life without esitation. Please, choose a link from upon to fully access this site and if you're a fan of Satoru and Saki, feel free to join their fandom! Shinsekai Yori (From the New World) is the property of Kishi Yusuke, Kodansha & Studio A-1 Pictures, all rights reserved. This is a fan-site and I don't intend to violate them. Layout and contents ©Dorothy. Images from the Official Site.